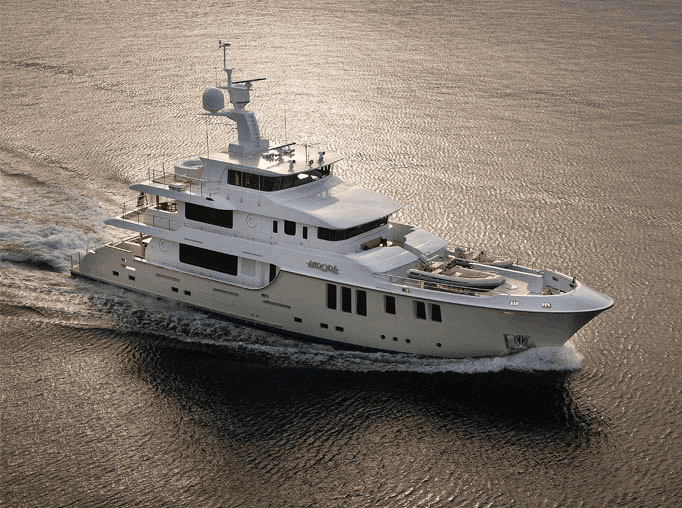 Aurora, Hull #1 in the Nordhavn 120 series, has been nominated for two international yacht design awards. Click here for live tracking of the voyage. You'll find a voyage overview, route, blog, photos, videos and other information at the Nordhavn 120 Delivery section of Nordhavn's website. Aurora, the first Nordhavn 120 built, has begun her maiden voyage from Xiamen, China, to Vancouver, Canada. 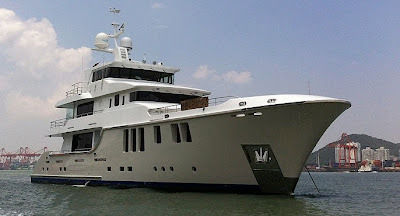 She departed the Coast Marine factory in Xiamen on July 16 for a 276-nautical-mile hop south to Honk Kong to shake down systems and to pick up 17,000 gallons of diesel fuel. From there, the plan is to run 6,000 nautical miles non-stop to Vancouver, her home port, arriving in about 25 days in the latter part of August. Weather permitting. Weather has already been a factor when Typhoon Solik tore across Taiwan to Xiamen, delaying the departure for Hong Kong. Now, Tropical Storm Cimaron is bearing down on Aurora at the Gold Coast Marina in Hong Kong. • Run from Hong Kong up to Tokyo – 1,500 nautical miles • Tokyo to Dutch Harbor – 2,675 nautical miles • Dutch Harbor to Vancouver – 1,619 nautical miles. All Nordhavns are designed to cross oceans but this all-new design places an even greater emphasis on ocean-crossing capability while maximizing interior accommodations that are well suited for offshore conditions as well as dockside living. 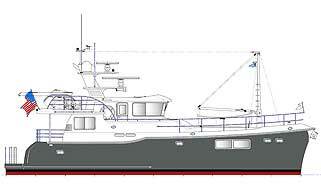 At 56 feet and with a displacement of 126,000 pounds, this new trawler yacht is ready to tackle the toughest and longest ocean passages. Standard propulsion will include the venerable 4.5 liter John Deere engines in a twin configuration and a fuel capacity of 2,335 gallons. This package combined with an efficient hull design will allow for a very comfortable transoceanic range and will retain the ability to maintain near normal cruising speed and positive direction control even if one of the two engines fail. Add paravanes and we're off! Click here for drawings and more information. 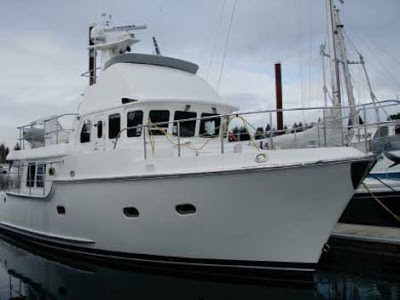 The Nordhavn 43 Earl R is the latest addition to brokerage listings at Pacific Asian Enterprises. The Nordhavn 64 B4 is the latest addition to brokerage listings at Pacific Asian Enterprises. The Nordhavn 43 Indian Summer is the latest addition to brokerage listings at Pacific Asian Enterprises. 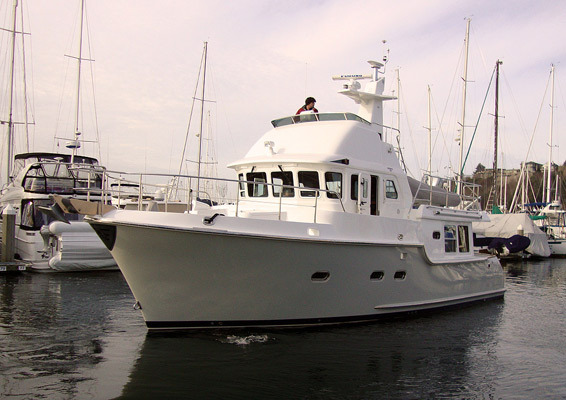 Click here for a video of Nordhavn sales rep Jeff Merrill guiding a tour of Island Magic, another Nordhavn 43 that's for sale. Click on the cover image to reach the Circumnavigator download page. 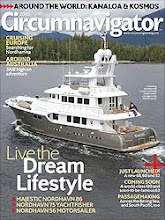 The new Nordhavn 63 has hearts a flutter all over trawlerdom, no less so in the offices of Circumnavigator magazine. In the banner above, that's a rendering by Stephen Davis of the new design from PAE. Click on any photo in the blog for a larger view. 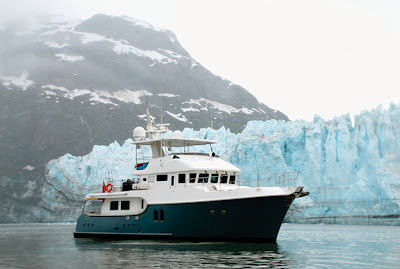 Thanks for stopping by for a look behind the scenes at Circumnavigator, the magazine about voyaging, cruising and living aboard under power sponsored by Nordhavn.